This past Memorial Day weekend the weather made it clear that summer is here. In DC, the air was thick, muggy and hot! Sam and I explored DC a bit and went to a public pool (free to all DC residents when you show your ID). It was relaxing and refreshing! We look like we went to the beach over the weekend. When hot weather comes to town, I search for recipes which don’t require too much time in the kitchen. I also like food that is lighter and easy to digest. Obviously, salads are the first choice- but I get sick of the same one’s over and over. So I search for salads with more color, texture and variety of ingredients. Remember when I mentioned that I studied abroad in Spain, and where I tasted my first croqueta? Up until then I was not a fan of tuna, it just wasn’t my thing. Until my señora started making me bocadillos (sandwiches), and many of them had tuna. So over the course of the summer, my love for tuna grew- I really don’t think I had any choice. Now that I like tuna, it’s nice to see something other than the regular tuna sandwich. 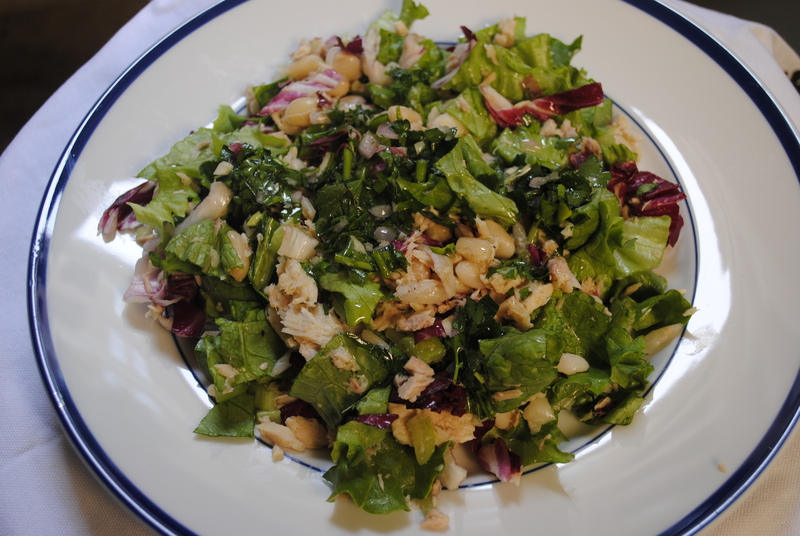 This salad was perfect: crunchy, light, refreshing and filling! Yum! If you wanted something a bit more filling, you can always add these ingredients into your next bocadillo! Combine all of the salad ingredients, mix well. Then combine all vinaigrette ingredients, shake or stir well. Drizzle the vinaigrette over the salad and serve. 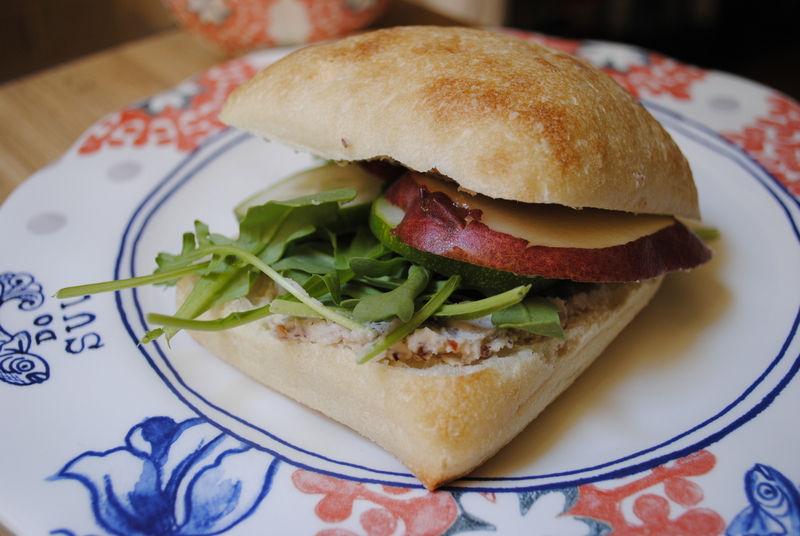 Another Monday, with another Food Matters Project recipe. This recipe was chosen by Keely of Keely Marie. 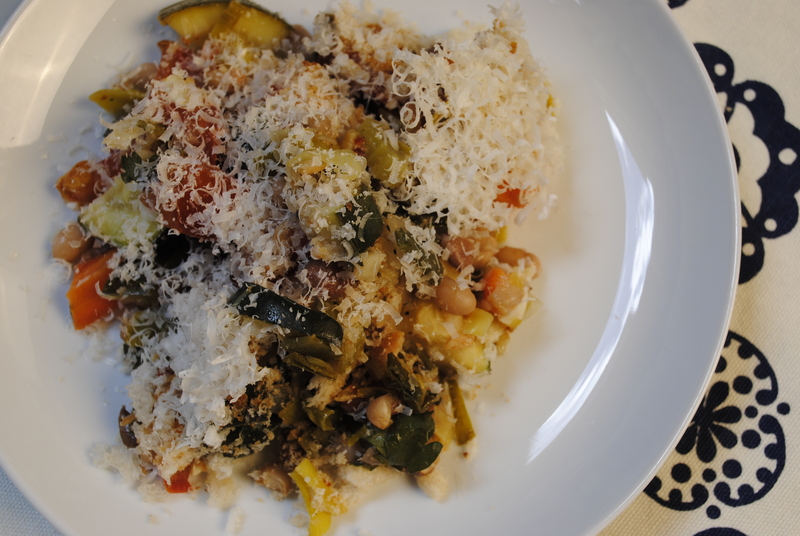 The Mark Bittman recipe which she chose was: Cassoulet with Lots of Vegetables. As always, you can find the original recipe in The Food Matters Cookbook. Keely also has a giveaway for 4 traditional cassoulet bowls from Le Creuset- definitely worth checking out! After Sam came home from India, one of the presents which I got was a cold, which has been with me for almost a week. Therefore, yesterday we were just relaxing at home, not doing much. At least part of the day was gloomy, so we didn’t feel too bad for just sitting on the couch. Since we weren’t in a cooking mood (that doesn’t happen too often), we made this recipe simple and easy. So no meat, lots of veggies and beans. Also, a layer of bread crumbs and cheese always makes things even more delicious! 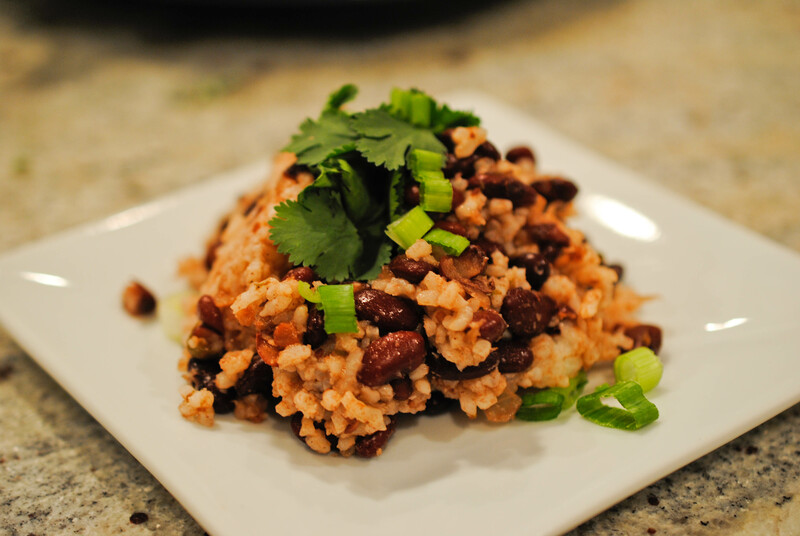 I used a combination of navy beans and pinto- it’s what we had in our pantry. But the options are endless- black beans, chickpeas or cannelini would be delicious. Feel free to swap panko crumbs for the bread crumbs. You can also top the casserole with a different cheese, or stir cheese into the dish (you might need more of it). The original recipe didn’t call for baking this, so feel free to omit this step. I just wanted a crispy and cheesy top, overall it’s very light, which is great for the spring weather everyone is having. Pour olive oil into a large pot, allow it to heat up a bit. Then add in the onion, garlic, leeks, carrots, celery and zucchini. Allow the vegetables to cook for about 10 minutes. Then add in the salt, pepper and red pepper flakes. Remember to stir the vegetable mixture. Preheat the oven to 350ºF. Spray an oven-proof dish with non-stick spray. In a large bowl, mix together the vegetable mixture, beans, tomatoes and parsley. Then pour in the ingredients into the dish. 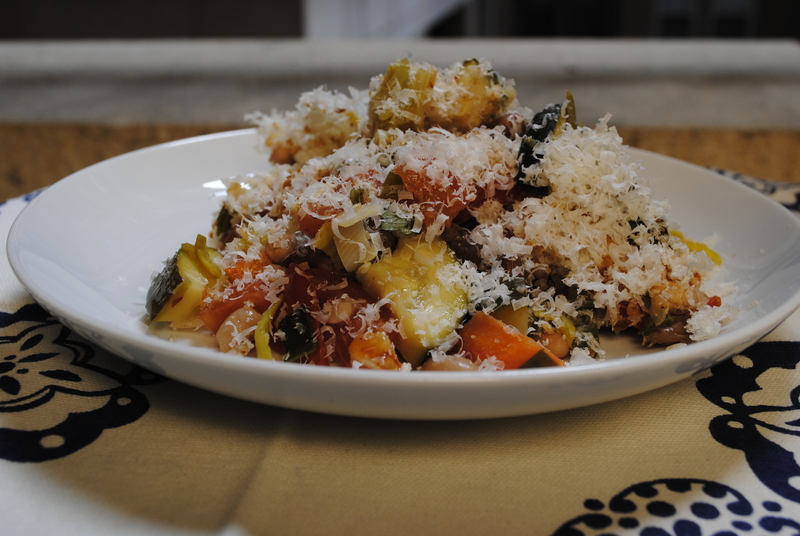 Sprinkle the top with the bread crumbs, and then with the Parmesan cheese. Bake the casserole in the oven for 20 minutes. Once it’s cooked, allow it cool off before serving. Summer is here, and so are all lighter meals, which is the reason for this salad. That, and I had a huge craving for tuna! Summer is one of those seasons that blows by us, it always seems far too brief. I remind myself to enjoy it- the outdoors, the warm weather (or humidity), the hot sun, and the long days. It’s that time of the year when we allow some of our obligations to slip away a little (or put off for another day or two). Instead, we spend it with our friends and family, outdoors. Sometimes it’s those BBQ’s on our porches, or happy hours outside on gorgeous Thursday afternoons; other times it’s reading by a tree, or enjoy the sand between our toes at the beach. Yes, that’s what summer is all about. So keep reminding yourself to sip some cocktails with your friends, linger over a couple more pages in that book, stargaze, daydream or enjoy a nap in the sun. Summer also brings amazing vegetables (and fruits) that we definitely need to take advantage of- asparagus being one of them. So go to your farmer’s market, grab a bunch of asparagus, and throw together this salad. The tuna can be exchanged for chicken (or none of the above). Cannellini beans can also be substituted for something else that works for you. Then, take that salad outside with a glass of wine, relax, and enjoy! Don’t let summer slip away! Heat water in a small pot. Once the water is boiling, steam the asparagus, covered, for about 3 minutes. Drain and rinse with cold water, drain. In a small bowl combine: capers, parsley, vinegar, lemon juice, olive oil, butter, salt and pepper. Stir well until all of the ingredients are combined. 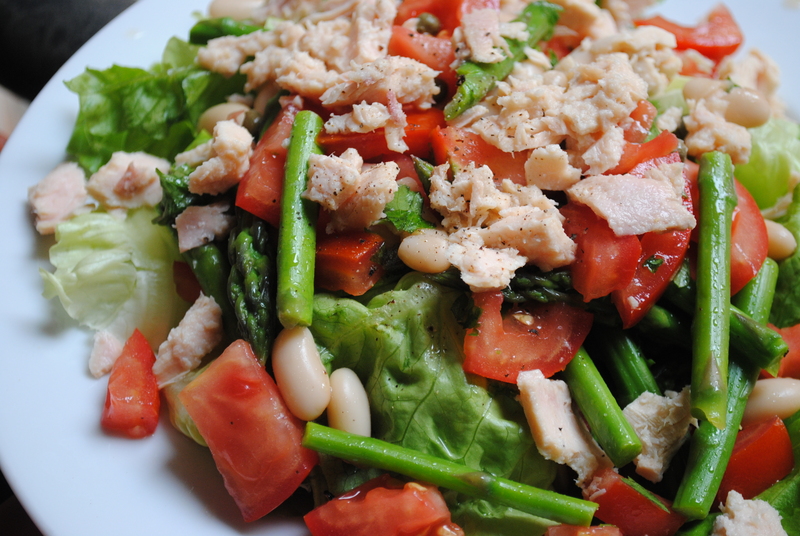 In a large bowl combine the asparagus, tomatoes, white beans and the juice mixture. Chop up the lettuce into smaller pieces. Add the vegetable and juice mixture on top. 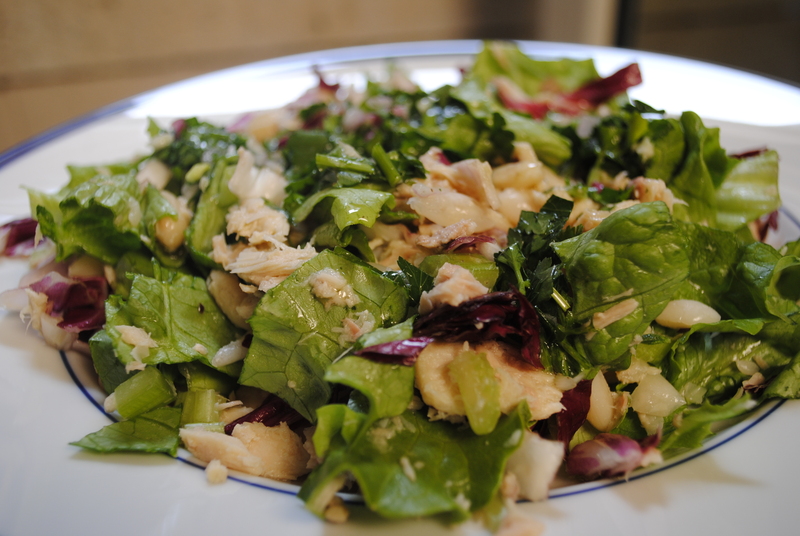 Lastly, add pieces of the tuna over the salad.